Why I Create An App That Named After My Good Friend? Marcus Tan, or some of you may know him as @curiousmarcus is man of many wonders. He runs an awesome startup Carousell and he is a great photographer1. 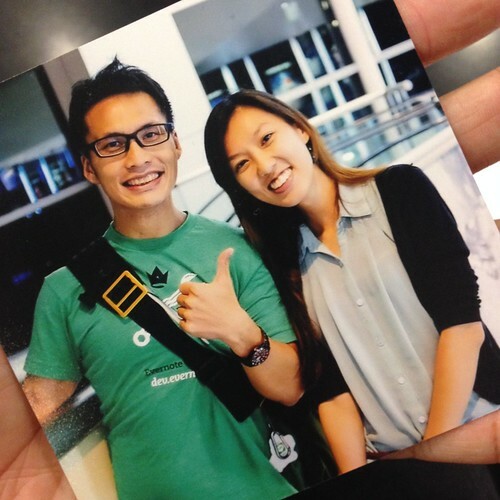 Weeks ago, we caught a movie together with the evernote team in Singapore. He took a photo of Lijiuan and me. We love it. And to our surprise he even printed out a copy for us as Xmas’s present. So I what could be the Xmas surprise from us? I decided to make an app that named after him and also help him to solve his big problem. He takes lot of photos and good ones too. Each photo carries meaningful moment that capture that particular point in time. But the photos are lost in the instagram timeline each time new ones are added. Can there be something that helps to trigger back these lost moments? I thought maybe I can help Marcus rediscover his old photos. A feature that Everpix2 had for it’s premium customers. It was also an opportunity for me to pick up web development too3. So MarcusApp was born. An app that sends you a weekly random photo that you took on instagram 6 month ago. I wanted to keep the app simple. I do not want to be bothered by authentication. I want Others who are interested to rediscover their old photos to use too. I keep the signup to a 2 step process. Merry christmas, Marcus! Lijiuan and I hope that you love this unique gift. As for updates, I would be adding flickr support too :D.